​We have raised puppys for almost 16yrs.My puppies are raised in a loving family environment. We work closely with our vets to give you the best quality healthy puppies and very fun playful puppys. 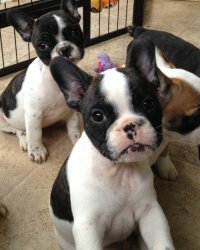 As for now we do have French bulldog puppies of 8 weeks old available so do contact us if you intern to add a pet in your family.